Ulster GAA organise a number of Diploma Courses accredited by OCN NI, which are on the Qualifications Credits Framework. These courses are ideal for coaches who have completed Award 1 & 2 National Governing Body courses and who want to specialise in team management and/or performance coaching. Graduate Brian Sherry spoke about the programme and his ability to use many of the principles in his every day work. Current Chair of the Provincial Coaching Committee and former Donegal Chairman & Senior Team Manager, PJ McGowan, emphasised how important application of the course skills and competencies were in his work as a County manager. Thanks are due to Paul O’Connor, Games Development Manager, Monaghan, for his direction in steering the programme group and to Sean McCormick, OCN for his support throughout the year. 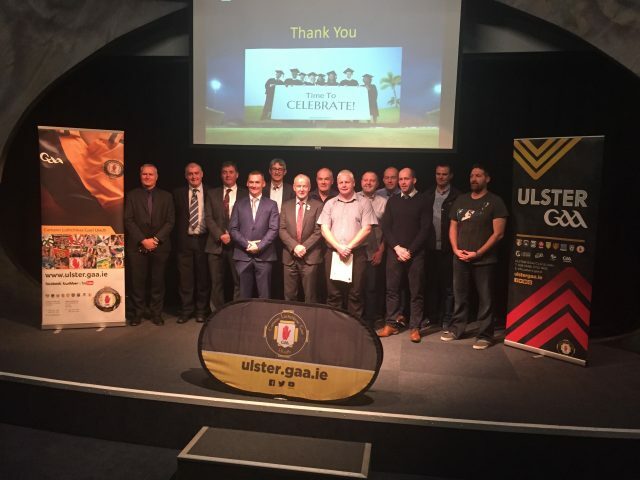 Michael Hasson President of Ulster GAA and Brian McAvoy Provincial Secretary were both in attendance and there was a great turn out from the graduates, who were accompanied by their partners.